Happiness and sadness are both just part of the emotional spectrum. Either emotion, you feel it, perhaps in response to events, and then you do your best to respond to that feeling. 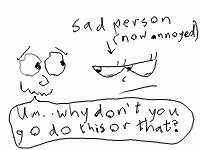 But if we feel as though sadness is a bad thing, we can tend to act rather unhelpfully around sad people. Hint: He’s doing it wrong. I mean, when you see someone who’s sad, do you ever think, “They shouldn’t be acting that way. Look at all the reasons why they should be happy. I’ll go help them out of it.”? You may think you’re being rather altruistic, but the truth is, you’re hurting the other person. Ok, a part of you may really care for the other person, and cheering them up may seem like the logical thing. But in order to be around a person feeling any emotion, you first need to deal with your insecurities about feeling that emotion yourself. That’s right, we need to learn to be sad! All that stuff about “don’t cry”, “be a man”, “don’t be sad” just covers over, with a veneer of manliness, that we just don’t WANT to cry or be sad. But this, I’m afraid, inhibits our ability to really be there for other people when THEY are sad. Because when we’re not ok with being sad, do you think another person will feel our acceptance when they are sad? Probably not! Ok, so maybe you’re on board now. You want to be there for people, and not be so insecure about being sad. But maybe you’re afraid. Maybe you’re scared of the feeling of sadness. That’s ok.
Just remind your insecure side that sadness carries with it an empowering message. Sadness is just an indication that something else feels wrong. Remember, babies cry very naturally when hungry, hurt, or feeling unsafe. Babies are on to something. They’re not crazy, they’re not wrong. The emotions communicate a message, and, most of the time, parents are the ones who respond to those messages. But you can also respond to your own sadness, and be with the part of you who’s sad without being judgemental. You don’t need to try and get yourself to do something that might make you feel happy. Just recognizing what your emotional self is trying to tell you can be enough. The Nurturer, doing it right. And yeah, hearing the real message might be tough sometimes. You may have learned to cover over your emotions even to yourself. But there’s no rush. If you don’t desire to get happy, you can stay with yourself when you’re sad. Don’t you think you’re more likely to hear the message when you’re listening for it? I know there’s a part of you who cares about other people, and naturally wants to tend their needs – and that’s the one who can overcome this insecurity. At least, that’s my experience. Think of a recent time you were sad. Try to relive the experience of being sad. Or, if you feel sad right now, use how you currently feel. If you resist the idea of being sad, ask yourself: Why? What am I afraid of being sad for? Stand down your fearful side by reminding yourself of why you’re doing this exercise in the first place: to really be there for yourself. Get past the insecurity. Once you feel the sadness, just be there with the feeling for a while. Resist the urge to suggest activities to yourself that you think will make you happy. Ask yourself, in your own way, what the part of you who feels sad really needs. Let the response surface. Be willing to listen to it. You are sensitive human being, and the part of you who feels sad may not trust you with the message directly. Regardless of what they tell you, just listen. If what this sad part of you needs is too tall an order right now, or if they can’t tell you yet – that’s ok. The important part is listening. Rather than trying to get yourself to a new state, be open to what your emotions have to say. 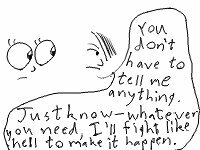 Those emotions might have a lot of problems with the way you act, by the way, be prepared, and just listen. The main goal of this exercise is to understand what you really need, deep down. That means something new may emerge from this. Take your time with the new knowledge. You may not know what to do with it, but at least you can dwell on it, and let it give you new ideas for what to do from here. Remember: Once you know how to be around yourself when you’re sad, you’ll be able to be there for others too. He’s also got a guided meditation you can go through to reacquaint yourself with your child-like self, the part of you who naturally expresses your feelings. Click here for that. Tony Robbins has a great chapter on emotions in his book, Awaken the Giant Within. You can find a summary PDF here (which includes a page on emotions), and buy the full book here. This entry was posted in Guides, Insights and tagged comforting, feeling sad, feelings, happiness, inner child, restricted emotions, sad, sadness, self-kindness by Oliver Kaufman. Bookmark the permalink. I really liked this article, it is true that some people think everyone should be happy, when they may just be covering up some other emotion with their facade of happiness… good tips to evaluate your emotions also!